Wall Street rallied for most of the day Monday before giving up its early gains in late-afternoon trading. Stocks returned close to their opening levels, but had shown signs of posting their fifth straight advance after reassuring comments from Federal Reserve Chairman Ben Bernanke and encouraging news from another big bank. 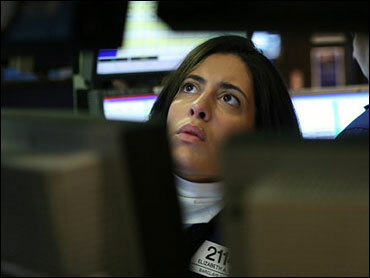 According to preliminary calculations, the Dow Jones Industrial average closed down 6.53 points, at 7,17.45. Bernanke said Sunday that the recession would probably end this year if the government's efforts to revive the banking industry succeed, but he cautioned that the task would be difficult. In an interview with CBS' 60 Minutes, Bernanke said the government needs to get banks to lend more freely and financial markets to work more normally. "The lesson of history is that you do not get a sustained economic recovery as long as the financial system is in crisis," he said. "But we do have a plan. We're working on it. And I do think that we will get it stabilized, and we'll see the recession coming to an end probably this year. We'll see recovery beginning next year. And it will pick up steam over time." David Hefty, chief executive of Cornerstone Wealth Management in Auburn, Ind., said Bernanke's comments gave the market a lift. "Absolutely it's reassuring," Hefty said. "The American people look to these people for that hope." Hefty said Bernanke's caveat that the end of the recession is predicated on the success of the government support for struggling banks is still a major question facing the economy and markets. Bernanke's comments about a possible end to the recession and the need for a recovery in banking and lending were similar to but seemingly more optimistic than testimony he gave before Congress last month. Stocks bounced higher then, but in subsequent sessions plunged and took the Dow and S&P 500 to their lowest levels in more than a decade as investors succumbed to pessimism about the economy. The market's tone has changed dramatically in the past week as better economic news - including word that Citigroup Inc. had operated at a profit in January and February - had investors betting that Wall Street had finally hit a bottom. The Fed chairman's comments Sunday helped reinforce the changing sentiment on the Street. Wall Street also had good news Monday from Britain's Barclays PLC, which also disclosed that it has been performing well in 2009. Last week, both Citigroup and Bank of America Corp., reported improving trends for January and February. David Kelly, chief market strategist at JPMorgan Funds, said the comments from some of the world's big banks are causing investors to re-evaluate their expectations. "The statements from banks are very encouraging," he said. "It's premature to talk about a turn in the economy but the stock market is priced as if the economy isn't ever going to turn around." In late-afternoon trading, the Standard & Poor's 500 index lost 0.41, or 0.05 percent, to 756.14 while the tech-heavy Nasdaq composite index dipped 24.76, or 1.73 percent, to 1,406.74. About five stocks rose for every one that fell on the New York Stock Exchange, where volume came to 901.8 million shares. "We're starting to build a base here," said Douglas Kreps, a managing director at Fort Pitt Capital Group. He said that each day that goes by without disappointing news can help further strengthen the market's legs. "Being able to go a week or more without bad news," is a good sign, he said. Gains on overseas market also fed the advance in the U.S. Japanese financial stocks surged on reports that the government would bolster their capital, while British investors were reassured by the Barclay's news. Japan's Nikkei stock average rose 1.8 percent. Britain's FTSE 100 gained 2.9 percent, Germany's DAX index rose 2.3 percent, and France's CAC-40 rose 3.2 percent. The KBW Bank Index, which tracks 24 of the nation's largest banks, surged 7 percent to 27.39. Shares of Citigroup rose 77 cents, or 43.3 percent, to $2.55. Bank of America gained $1.12, or 19.4 percent, to $6.88. JPMorgan rose $1.42, or 6 percent, to $25.17, while Wells Fargo rose $1.05, or 7.5 percent. Chris Johnson, president of Johnson Research Group, noted that some short covering was still helping to boost the market, though not to the extent as it did at the beginning of the rally last week. Short covering occurs when investors who sold borrowed stock on expectations the market would fall are forced to buy shares to repay their debts. Investors were able to shake off more weak economic data. The nation's industrial output fell for the fourth straight month in February, falling 1.4 percent and hitting the lowest level in more than 50 years of record keeping. Momentum from last week's rally is carrying over to support Monday's trading. Hefty said gains are likely to continue into at least Tuesday. "Investors have a stampede mentality," Hefty said. "They stampede in and they stampede out." He added that the current rally is probably not sustainable, and mostly just helping bring the market back to a range near the previous lows seen in November. Bond prices fell Monday as investors gravitated toward stocks. The yield on the benchmark 10-year Treasury note, which moves opposite its price, rose to 3 percent from 2.90 percent late Friday. The yield on the three-month T-bill, considered one of the safest investments, rose to 0.23 percent from 0.20 percent late Friday. Light, sweet crude rose 56 cents to $46.81 per barrel on the New York Mercantile Exchange. The Russell 2000 index of smaller companies rose 6.99, or 1.8 percent, to 400.08.